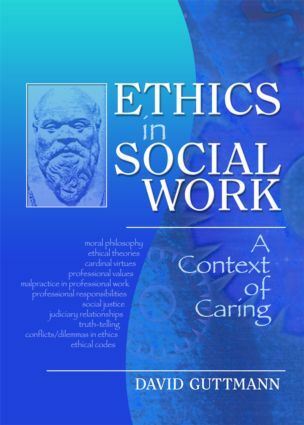 Ethics in Social Work introduces students, practitioners, and educators to theoretical and conceptual approaches to professional ethics and to the practice-related aspects of dealing with ethical problems and dilemmas. This unique book equips social workers with the ability to choose among different perspectives on the place and value of ethics in their approach to clients, and to use, defend, and explain their choices to clients, colleagues, supervisors, administrators, the general public, and the courts, if necessary. The book examines classical ethics, theories, and codes of ethics, virtues and values, etiquette, professional responsibilities, distributive justice, judiciary relationships, professional misconduct, and malpractice. A working knowledge of ethics is essential for the development of a healthy and happy relationship between service providers and consumers. Ethics in Social Work looks at how ethical issues and conflicts can affect the daily lives of social work practitioners and how an increased sensitivity to those issues can help enrich their professional experience. The book addresses the basic concepts relating to ethics, as well as theories, principles, rules and values that guide service provision based on the National Association of Social Workers Code of Ethics and Standards for Cultural Competence in social work practice. Ethics in Social Work includes case illustrations from existing literature and from professional experience, as well as an up-to-date bibliography. It is an essential read for anyone working, or preparing to work, in the helping professions. The Ethics of Martin Luther King Jr.